Our three-week European adventure began on April 28, 2012. The months leading up to the trip were spent pouring over travel books checked out from the library, online travel forums and gazing at my travel Pinterest board. Initially we planned on seeing Europe in one sweep. 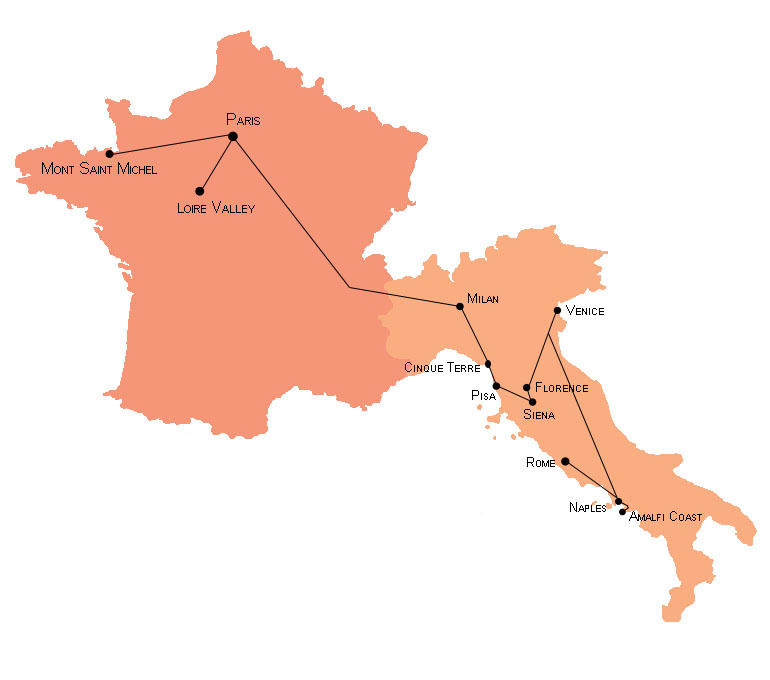 After careful research we limited our travels to Italy and France, flying into Rome and out of Paris. 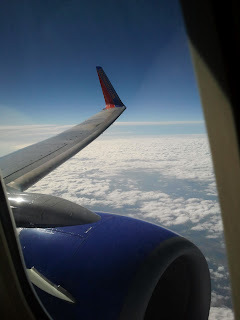 After long layovers (overnight in Boston with Jacob's cousin and eight hours in JFK) and sitting on the tarmac for almost two hours, we were off! We arrived in Rome in mid morning, later than expected. We hopped a train from the airport to the center of Rome to find our apartment we rented for our stay in Rome. The renter, Paula, was worried after expecting us much earlier. We dropped off our backpacks, went to the bathroom and zipped off on the metro to Vatican City, the smallest independent-city state in the world. I was worried about the notoriously long lines at the Vatican Museum. As luck would have it, the line was non-existent. At first we thought we were at the wrong entrance because we were able to walk right in. After seeing photos of the incredibly long lines, I consider ourselves seriously lucky. 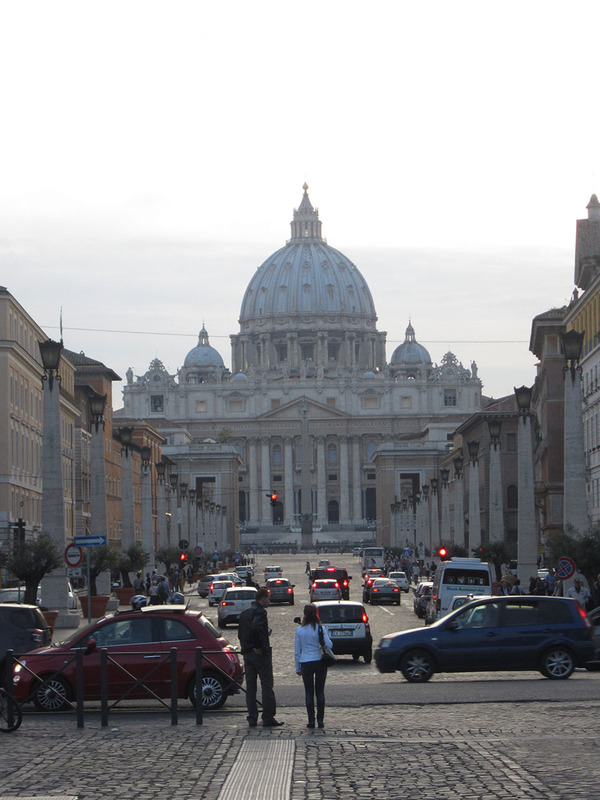 The wall surrounds Vatican City and the famous museum. The museum houses many incredible works of art including the Belvedere Torso and other artwork by the big heavy hitters (Raphael, Titian, da Vinci etc). Other Vatican Museum highlights included the sarcophagus of Imhotep, incredible courtyards, frescoes and tapestries and the Vatican post office with collectible stamps. The Belvedere Torso- believed to be from the first or second century. The School of Athens by Raphael, a favorite painter and, coincidentally, favorite ninja turtle. The "Raphael Room" is body-to-body. I was lucky I was only photobombed by one person. 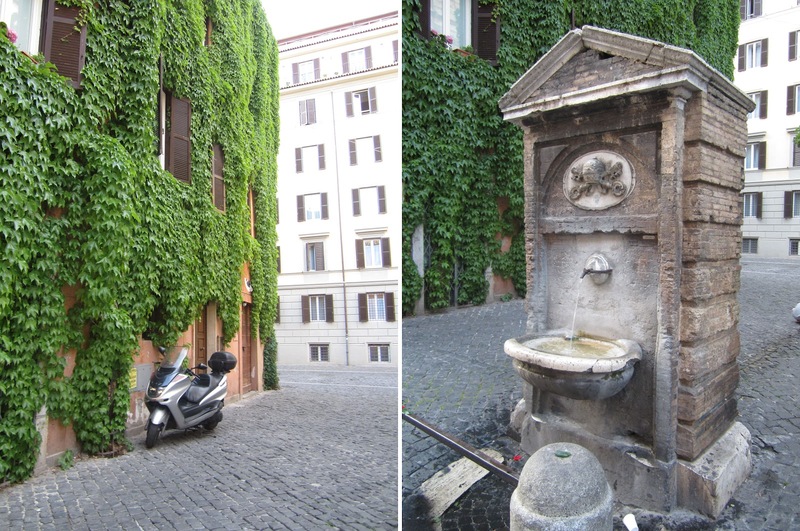 The public water fountains were a favorite part of Italy. Every drinking fountain should look this fancy. 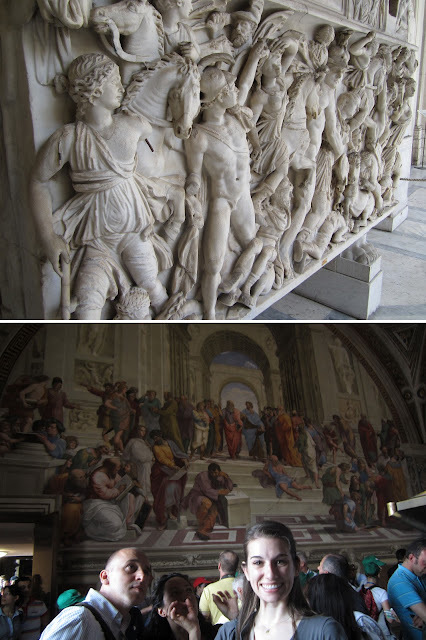 The ultimate highlight in the Vatican Museum is the Sistine Chapel. The chapel is jam packed with other tourists vying for a chance to see Michelangelo's famed ceiling. It is, in a word, incredible. I wish I had brought a mirror to see the reflection. My neck was sore because I couldn't take my eyes off it. The rules in the Sistine Chapel are (1) be quiet, (2) no photos and (3) individuals must exit through a specified exit. We tried to break two of the rules (photo above is one), but failed miserably when we tried to sneak out with the tour groups. 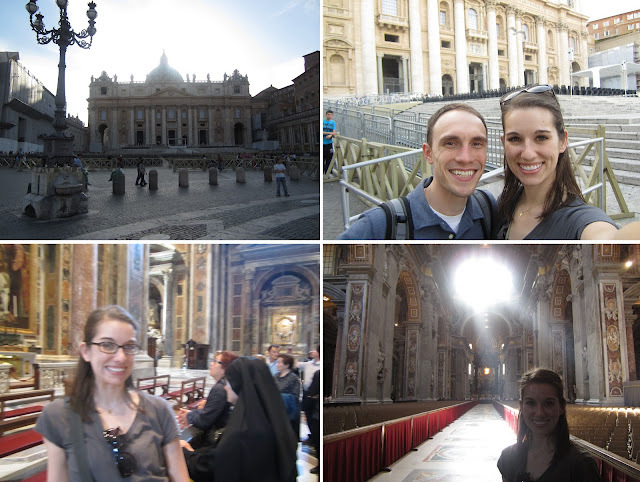 The tour group exit is a shortcut to St. Peter's Basilica that saves museum goers a 20-minute walk. We were made after our second escape attempt when we tried to sneak out with an Asian tour group. We finally gave up and took the long route. sneaking a picture with a nun (i love nuns) | peering down the nave of the basilica. A new bishop was getting ordained the next day so much of the Basilica and surrounding courtyard were blocked off with chairs. We timed the visit just right so it was during afternoon mass. The warm afternoon sunlight spilled into the chapel while the music from mass swelled throughout. I love witnessing other religious ceremonies. Religion is so important to me, and you can feel the faith and spirituality is all religious places, especially one so historical. Swiss Guard. The switching of the guard drew quite a big crowd. I think the outfits had something to do with it. That takes a confident man. 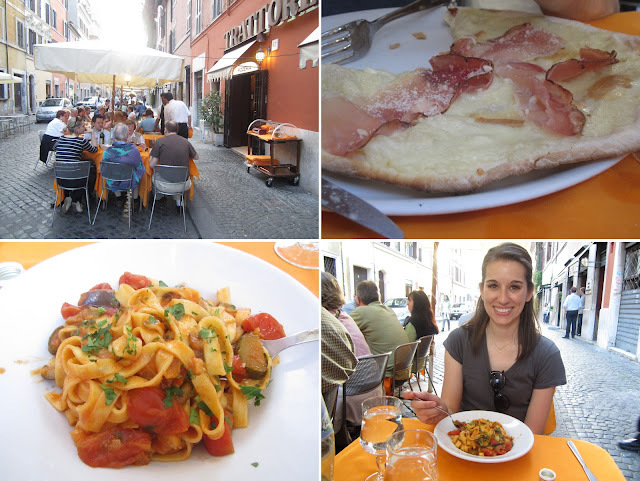 We ate dinner near Vatican City at a restaurant on a pedestrian-only street called Borgo Pio. For choosing a restaurant on a whim, (note: always try to eat where other Italians eat) we lucked out with an incredible first meal. At dinner I felt very self conscious about using the Italian I had been practicing. I second guessed everything I knew and resorting to smiling a lot and relying on Jacob to order for us.My confidence grew as our trip went on, but I wish I would have been more assertive in practicing Italian. Our waiter was very sweet and patient so I should have taken advantage of that kindness to practice. We started the morning admiring the impressive parking jobs of the Romans. They are certainly scrappy when it comes to parking. 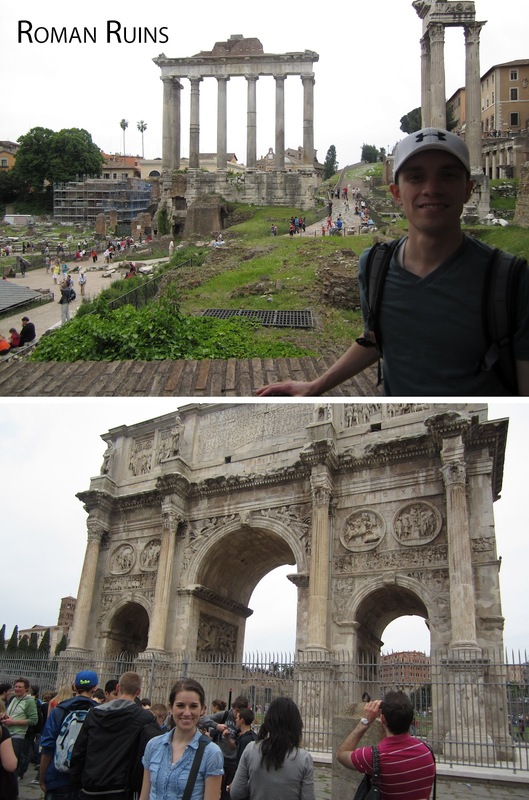 Ancient Rome was on our agenda for our second day in Rome. 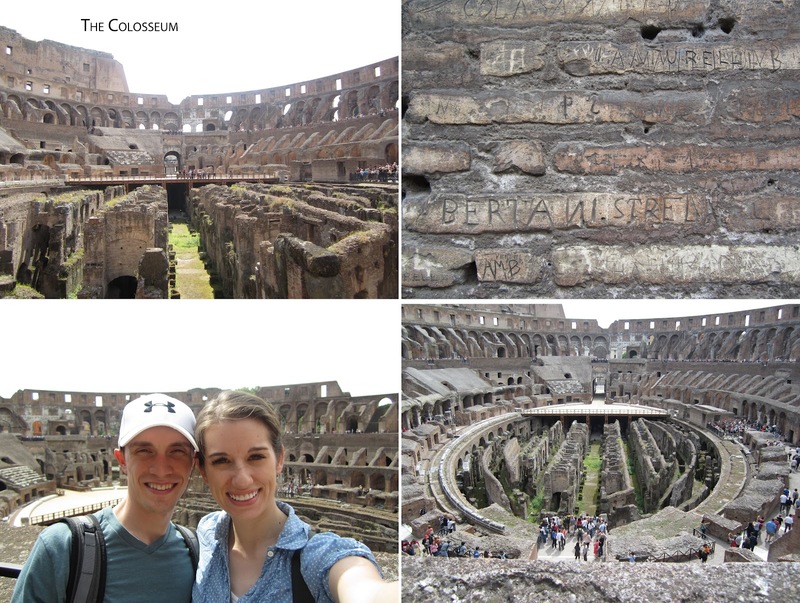 We hit up the Colosseum which is massive. The 2,000-year-old structure was used for the famed gladiator contests. In its heyday, it could fit 50,000 violence-loving fans. The underground chambers (that looks like little mazes) housed the animals that were lifted up by elevators. We skipped incredibly long lines (of at least 500 at the Colosseum) with the Roma Pass. Friends, if you are going to Rome, this is the pass for you. It included entrance to most sites and transportation. But the best part was you got to go to the front of the line. Instead of waiting a couple of hours, we were in within minutes. Assertiveness is key to getting to the front, but it is worth it. 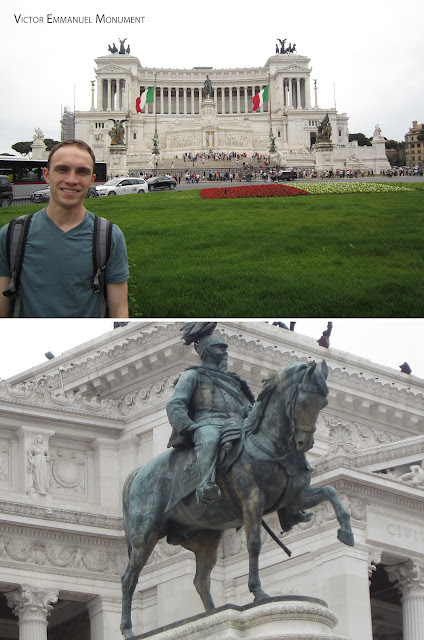 The Victor Emmanuel Monument is huge: 43 feet long to be exact. To put it into perspective, the mustache on Emmanuel is 5 feet long and a human would fit on the horse's hoof. 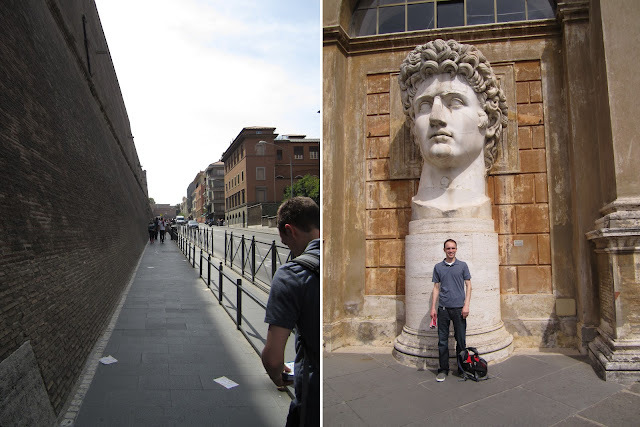 We tried our hand at the Roman bus system to get to the catacombs but failed miserably. And the Catacombs closed by the time we figured it out. I satisfied my need to see artfully arranged bones at the Capucchin Crypt. Photos are forbidden. This one found here. A small, unassuming church houses the very creepy, yet cool underground crypt. 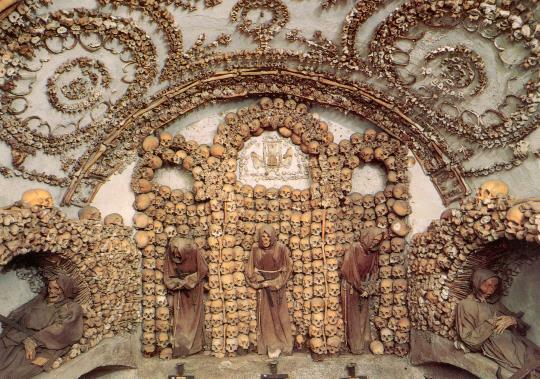 Bones from more than 4,000 friars decorate six crypts. Not pictured is the clock made out of vertebrae. Never seen that before. 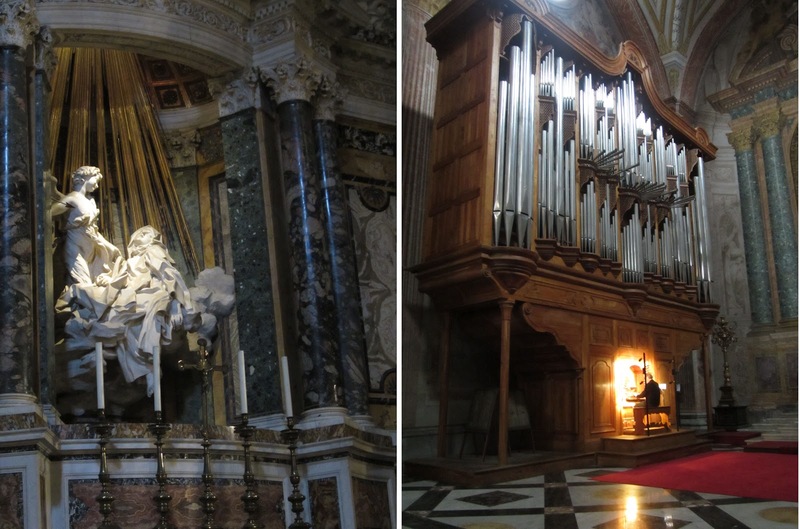 We finished up the day with a church tour: Santa Maria della Vittoria which houses Bernini's famed St. Teresa in Ecstasy and Baths of Diocletian for an organ performance on the largest organ I have ever seen. Many of the churches are dark and cold. To illuminate the artwork, you must put coins into a slot. The lighting is timed but it makes the artwork gleam. Most of Rome's popular sites are inundated with tourists. Two biggies are the Trevi Fountain and Spanish Steps. The night before those sights were uncomfortably crowded. I heard that early morning was incredibly serene and we set out to make it happen. We made it to the Trevi Fountain at 7:45 a.m. and shared it with about 15 other tourists. It was heaven. The fountain is massive yet tucked between buildings and side streets. 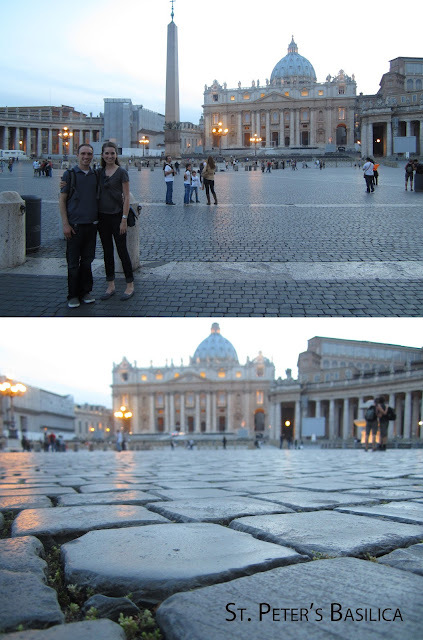 They say tossing a coin into the fountain ensures a return to Rome. So we did. 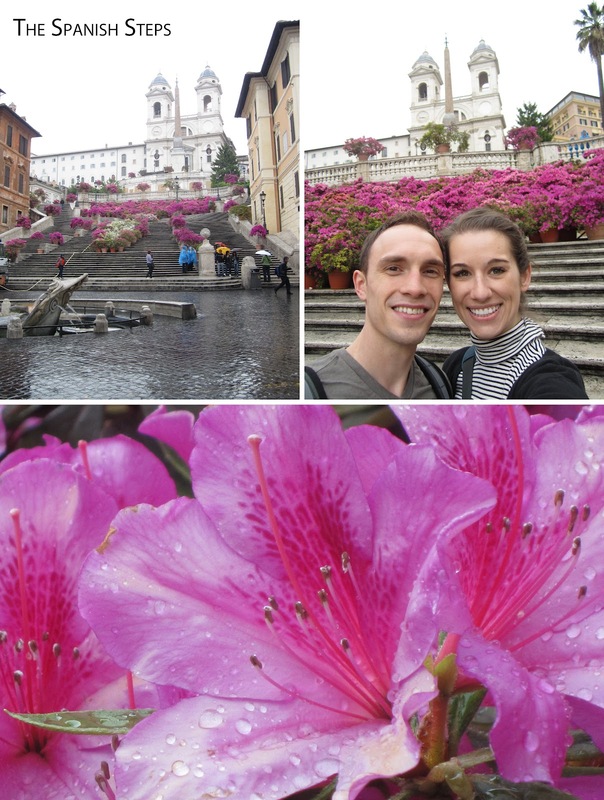 We also made it early enough to get the Piazza da Spagna, or more popularly know as the Spanish Steps, to ourselves. The Spanish Steps lead up to the Spanish embassy. The rain might have kept the crowds away and dampened the day a bit, but the blooms made up for it. Even the storm drain is pretty in Rome. 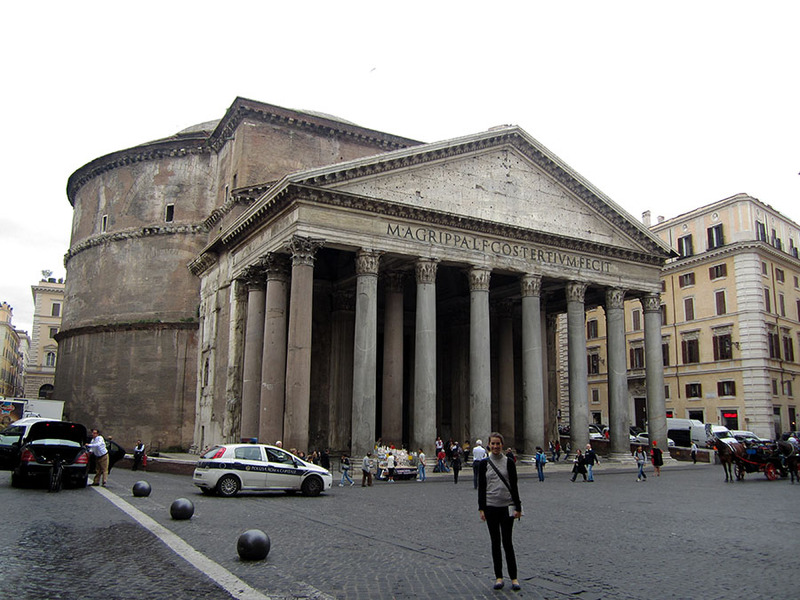 We were strolling through the streets and then BAM, the Pantheon rose out of the tight, surrounding buildings. The intimidating building has mathematically-perfect architecture that is stunning. The dome is as wide as it is tall and stands without any supports. We ended up at the nearby Piazza Navona. The famed Four Rivers Fountain (featured in "Angels and Demons"). 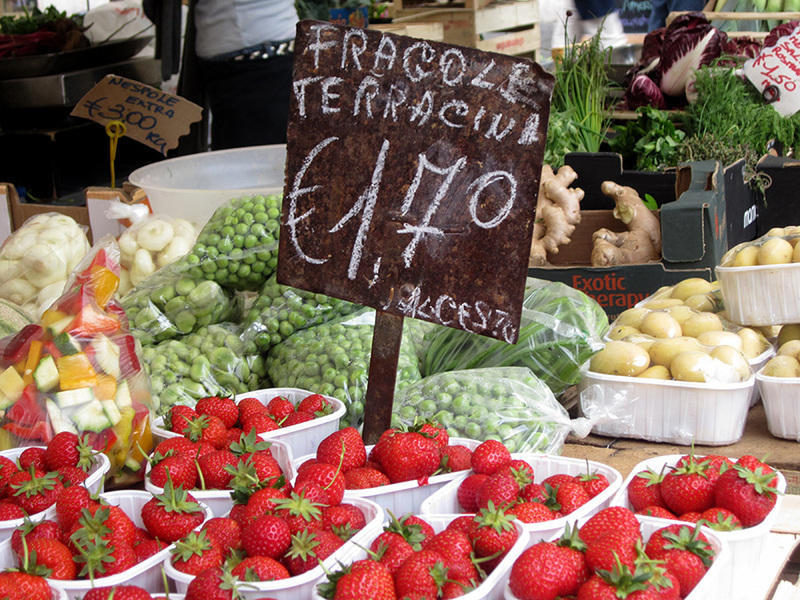 The people watching at this Piazza was unparalleled..
We went to Camp de' Fiori just in time for the bustling lunchtime market. 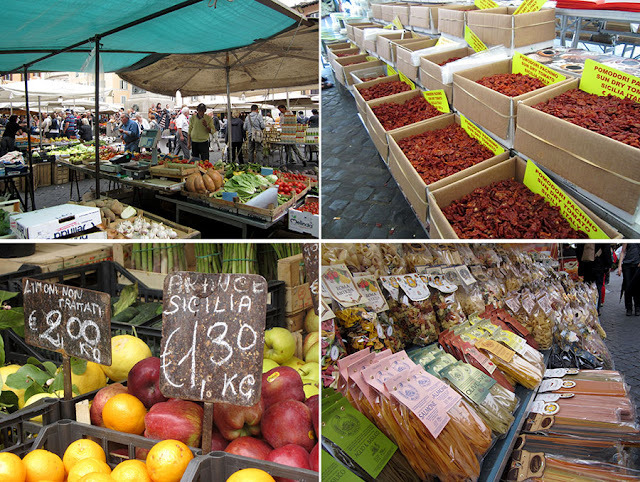 Food stands sold every type of pasta you could imagine (hot pink or Colosseum shaped if you want), fruit, sun-dried tomatoes and cheese. It was delightful chaos. We decided to give the bus system another chance to make it to the Catacombs of San Sabastiano. The burial places of the ancient Roman Christians currently houses no bones, but it was still really cool. Our tour guide was an Australian priest who livened up the tour (pun intended). The tombs were surprisingly small; people were really short back then. Photos were forbidden. For some reason this was a place that I followed that rule. It seemed fitting to end our Roman adventure with a night stroll in front of the Colosseum. Pizzeria da Cocco was recommended by our apartment owner, Paula. No one spoke English and the pizza was great. It was a late-night meal. Italians eat dinner out very late. It was after 9 and it was packed. A little sneak peak of our apartment. We found it on Trip Advisor and we loved it. It fooled us into thinking we lived there. 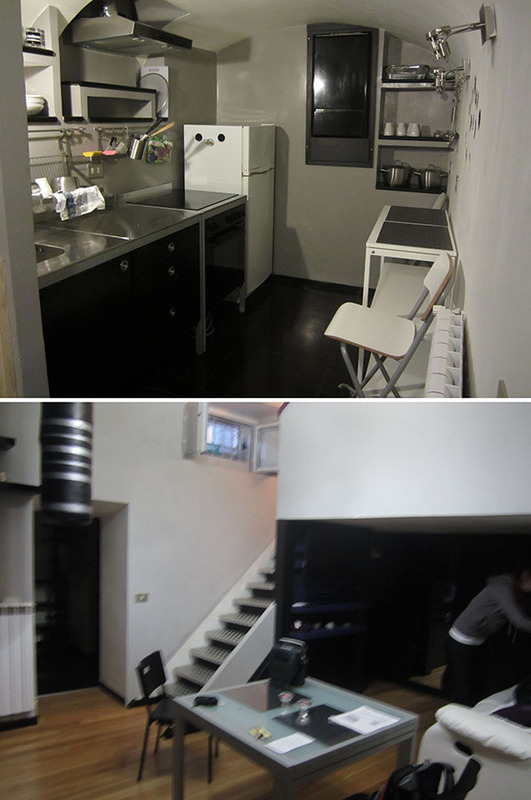 Kitchen, TV was strange music videos and our own punching bag. What more could you want? Plus, it was cheap. Win, win. Our favorite Roman advertisement: the genie weenie dog. It followed us throughout our adventures in the city. It's been forever since we went to Italy, and I loved looking at your photos. We had a very similar itinerary as yours, but we started in Milan and worked our way down. :) Loved Rome! 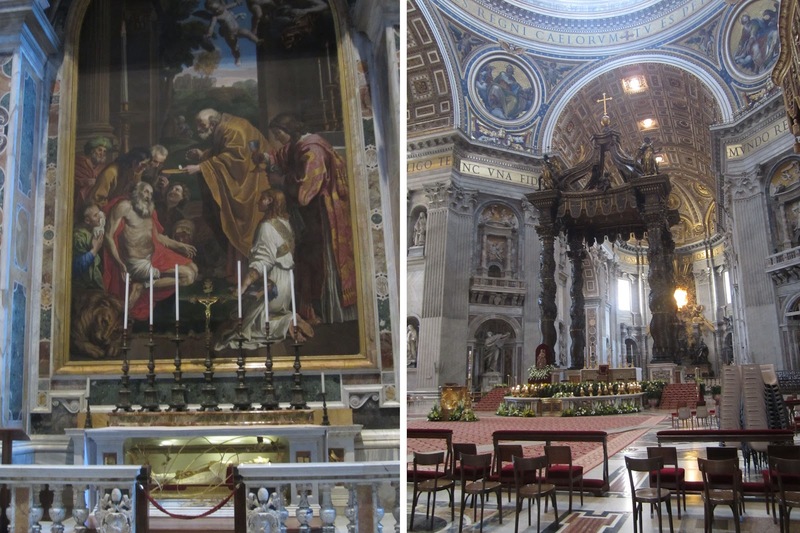 The Sistine chapel brought me to tears.